The FIFA World Cup is up and running with Russia securing a thumping 5-0 victory over Saudi Arabia in the opening match of the tournament. Today will see Egypt clash with Uruguay in Yekaterinburg, Morocco take on Iran in Saint Petersburg, and the European heavyweights, Portugal and Spain doing battle in Sochi. It is great news for football fans who have had withdrawal symptoms since the domestic campaign ended May 13. But with the conclusion of fixtures, the title race in the Galway Advertiser Tribal Leader League in association with St Anthony's and Claddagh Credit Union was decided and our champions confirmed. Congratulations to Kevin Fahy and his charges Repeal Madrid who ended up with a grand total of 2,459 points; 138 clear of the chasing pack. 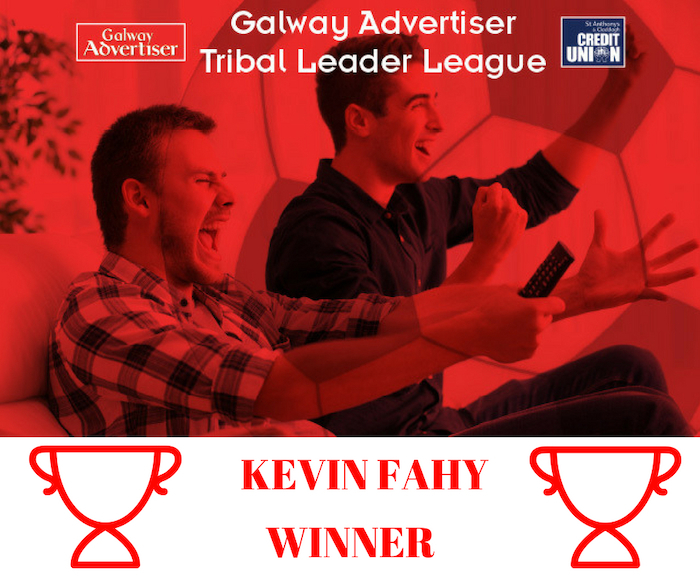 Fahy and his men not only are bestowed the prestigious title of the Tribal Leader League champions but will receive a cash prize of €250 and tickets to the Galway Races. On behalf of St Anthony's and Claddagh Credit Union and the team here at the Galway Advertiser, thanks for taking part and we look forward to seeing you in August.